In a nail biting final held on Monday 25th January, eight talented soloists from Churchill Academy & Sixth Form bravely performed to a packed audience at St. John’s church. Always a popular event in our musical calendar, this year’s competition absolutely exceeded all our expectations. The judging panel was chaired by Richard Dickins, Director of Music, Imperial College London and former Principal Conductor at the Royal College of Music Junior Department, with Alice Harper MA, Churchill Music Trustee, and Adrian Trapp MA, Director of Music, Weston Parish Church, in support. They had an incredibly hard decision, given the high standard and prodigious talent of all the young musicians competing. 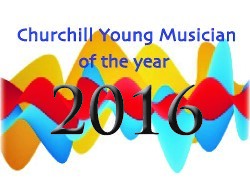 Notwithstanding this challenge, after considerable deliberation, they were able to announce Katie Barber (Yr 12) as Churchill Young Musician of the Year 2016. During the Judges’ deliberation, and whilst sampling the famous Churchill Music Canapés, the audience was superbly entertained by the Churchill Academy Chamber Choir conducted by Paul Harrison. Before giving out the prizes, Mark Trego, Music Service Leader, North Somerset Council, commented on the high standard of music provision in North Somerset which national audits indicated cut well above the national average. He added, “in discussions with the Arts Council, they particularly highlighted the contribution made by Churchill Music”. Our trustees were thrilled to receive this accolade. Thanks to our partnership with St. George’s Bristol, prizewinners are given the opportunity to perform at their special Young Person’s Platform concert held on Friday 29th January at 1pm. In addition, thanks to Wrington Vale Rotary Club for giving the winner the opportunity to enter the district final of the Rotary Young Musician of the Year competition to be held on February 28th at Kings of Wessex School. The evening was an excellent example of what can be achieved through the collaboration of the local community and its schools in celebrating the hard work, dedication and commitment of these talented students, supported by their teachers and families. It really does highlight what Churchill Music is so passionate about – bringing music and education together. Finally we salute our Churchill Music Champions – it is they who make this competition possible through the generosity of their time and donations. We give them our heartfelt thanks.